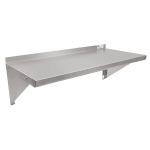 The John Boos EWS8-1660 wall-mount shelf can hold spices, flavorings, or small equipment. It will not easily scratch or bend since it is made of stainless steel with a satin finish. Injuries are prevented with the stallion edge front that gets rid of sharp edges. The unit has a 11⁄2-inch backsplash to provide extra support when mounted. Since the shelf is TIG welded, it withstands heavy use. The John Boos EWS8-1660 wall-mount shelf has a uniform appearance since the welded areas are smooth to match adjacent surfaces. The shelving, racks, and carts buyers' guide provides in-depth information about different shelves and their benefits.